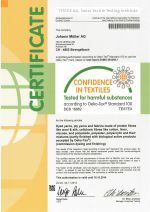 Johann Müller AG was certified in 1993 in accordance with the Oeko-Tex® Standard 100 as the world’s first textile finishing company. In the forefront of it, Dr. Kurt Müller has significantly contributed to the design of the Oeko-Tex® Standard 100. Read more in OEKO-TEX® news 1/2009. In addition to this certificate, we provide our customers a personalized certificate with a list of articles. 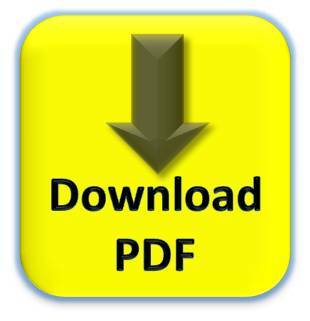 This list contains the articles including their respective color that meet the limits and the resistances of the corresponding product classes (I – IV). Applying to commission dyes: The articles may only be certified with the Oeko-Tex®Standard 100 certificate of the appropriate product class, if the raw material provided to us for processing as well fulfill the needs of the particular product class. 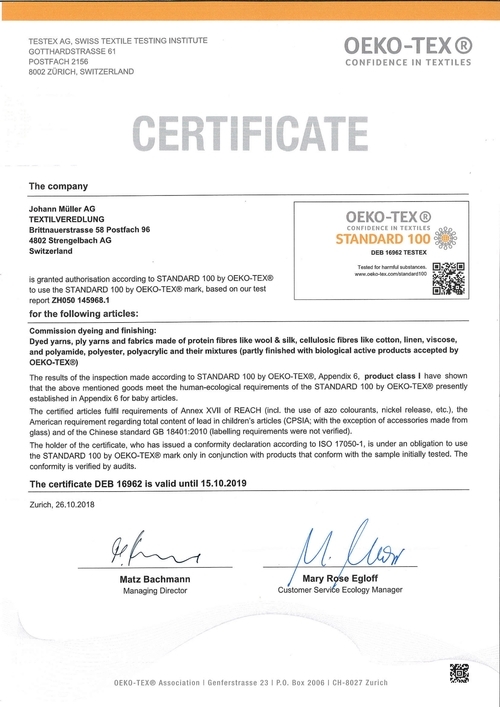 All subsequent operations must also comply with the relevant product class so that the final product may be issued the Oeko-Tex® certificate of the corresponding product class. Click here for more information about Oeko-Tex® Standard 100.